Spinal column anatomy. Artwork of a lateral (side) view of four vertebrae, the blocks of bone that form the vertebral column or backbone. Three are sectioned to show the intervertebral discs (green). The protruding bony processes (left) at the rear of the body are the attachment point for back muscles, ligaments, and fascia (white). Various ligaments hold the vertebral column together. 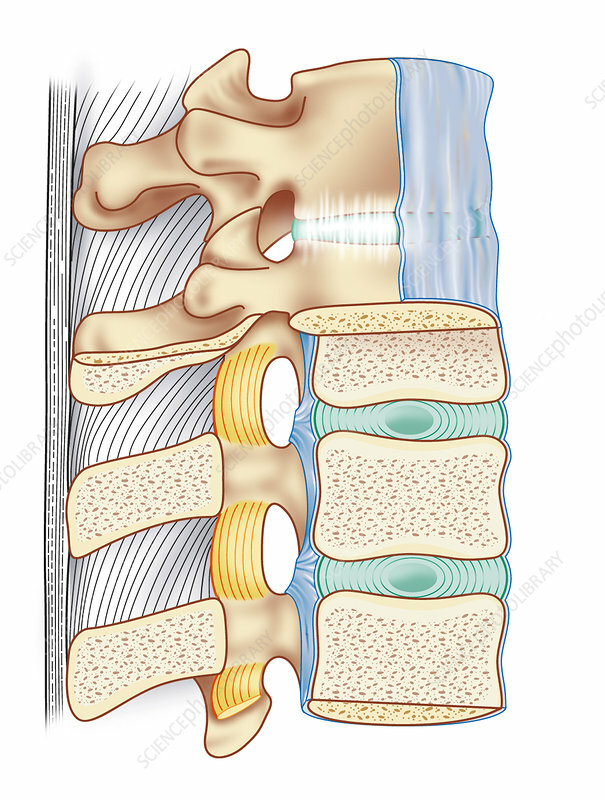 The anterior longitudinal ligament (blue, upper right) and the posterior longitudinal ligament (blue, lower centre) run along the front and rear of the vertebral bodies. The ligamenta flava (yellow) connect the laminae of adjacent vertebrae.